Welcome to Orange Week, featuring a healthy dose of orange goodness every day. I'm on vacation this week, but pre-scheduled posts will keep the blog living up to its name. Artwork kicks things off! 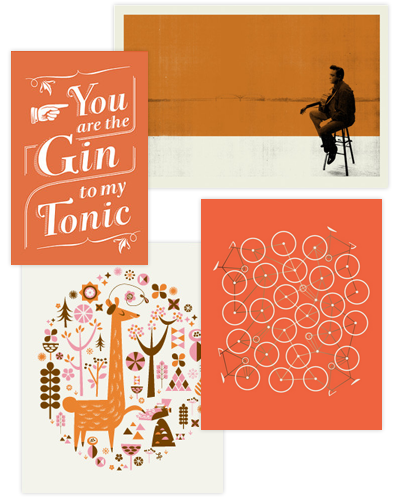 Perhaps you need gin, Johnny Cash, bikes, or a llama? Or try birds, kitty, coffee, or cart. I suggest you go on holiday to the Netherlands during the coming couple of weeks. We are entirely orange until we get kicked out of the European soccer championships (which might be during the final, so it could be a while). Orange is definitely my least favourite colour. Nevertheless I love your blog! 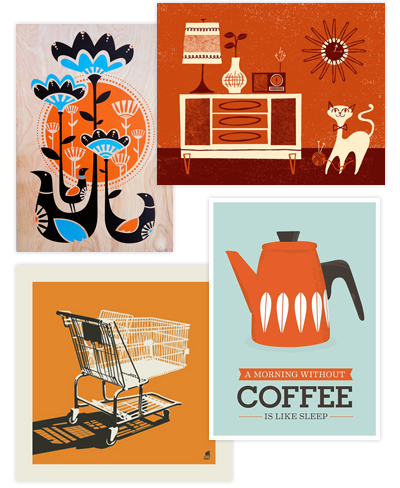 And these posters are great, I especially like the coffee one! Yay!! Orange week!! Great art today. Can't wait for more orange'y goodness tomorrow :). Enjoy your vacation and thank you for sharing orange week! SO glad I stumbled across your blog! So much inspiration! I'm a new subscriber and would love the follow back :) Enter my giveaway for a Nordstrom and Starbucks gift card! that llama print is adorable! These are all so funky! You've got great (orange) taste!